Nose: Seaweed, peat, salt, and leather. A slight hint of dried fruits and nuts. Both the seaweed and peat really dominate, but overall the nose is quite subdued compared to other Octomore editions. Palate: Massively peaty and vegetal, with quite a bit of iodine as well – not Laphroaig levels of iodine, but probably the highest levels for an Octomore. Strangely a little bitter at the back of the tongue. Mouthfeel: Midweight and oily. A slight alcohol burn. Finish: Decent length, although a little subdued. Quite a bit of iodine and vegetal notes, along with the ever-present peat. A touch of eucalyptus is also surprisingly present at the end as well. Balance: The balance is pretty good on this one – most of the notes flow through from nose to finish. A little jarring between the nose and palate, but only slightly. The eucalyptus notes at the finish were also a little off-balance with the everything else. Bruichladdich’s Octomore 6.1 was aged for five years in ex-Bourbon barrels that were aged in Bruichladdich’s warehouses on the west coast of Ireland. It was peated to 167ppm (a massively 2ppm lower than the brevious x.1 release, the 5.1), and bottled at 57%ABV with no chill-filtration, and no colouring. As the name/label that Bruichladdich assigned to this edition, Scottish Barley, suggests; all of the barley for this edition was grown in Scotland before being peated and malted at Bairds in Inverness. 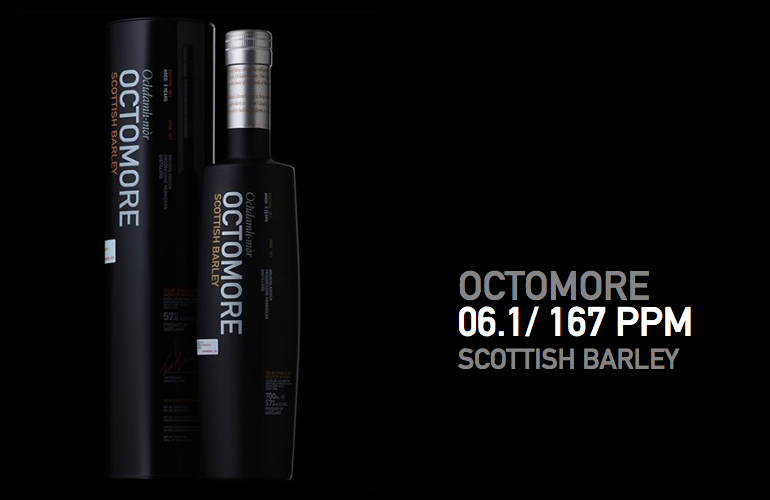 Starting with edition 6.1, Bruichladdich is really stepping up their terroir campaign with Octomore, following on from the main Bruichladdich line; which has had Scottish Barley, Islay Barley, Bere Barley, and Organic Barley releases. The barley in Octomore 6.1 comes entirely from within Scotland (a majority of Scottish distilleries source their barley from wherever is cheapest), and the following 6.3 is entirely made up of barley grown on the isle of Islay. Octomore 6.1 isn’t a bad whisky, in fact it is a pretty decent whisky, but it is still my least favourite Octomore release (I suppose one of them has to be). None of the notes on the nose, the palate, or the finish are terrible or repulsive in any way – although it has a bit much iodine on the palate for an Octomore for me. It is also reasonably well balanced, and has a completely neutral mouthfeel – which I think is the problem; apart from the extra iodine and seaweed notes compared to most Octomores, this edition is just pretty bland – as far as Octomore editions go (I don’t think there is actually any release of Octomore that is bland as far as whiskies go). Whilst I wouldn’t turn down a dram of Octomore 6.1 if offered, I probably wouldn’t go out and buy another bottle of it. A little bit disappointing for a whisky from my favourite whisky series.